The Clockwork Portal Trap is a Shadow type weapon. 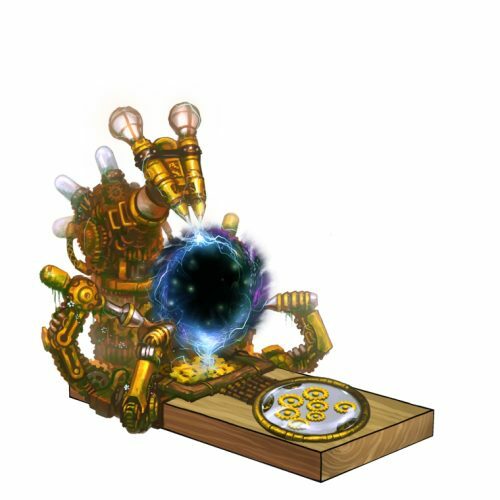 Combining magical theorems from previous portal traps with "modern" clockwork technology, the Clockwork Portal Trap represents the pinnacle of Shadow trap development. Lying dormant until a mouse attempts to steal a piece of cheese, it looks fairly unassuming, if complicated. But the moment a mouse steps upon it, pre-charged capacitors flood it with energy, instantly creating a super-powered portal that whisks the mouse off to who knows where... or when. The Clockwork Portal Trap is not sold by any Trapsmith. It can only be crafted given the proper ingredients. Clockapult of Time - Source of Clock Parts. 14 November 2012: The Clockwork Portal Trap was introduced with the introduction of the Living Garden. This page was last edited on 1 March 2019, at 17:38.